The ODL converts analog RF signals in the 10 MHz – 6 GHz range to optical signals and back. The RF input signal is converted into an optical modulated signal, which is then transmitted into a single mode fiber. This creates a fixed time delay defined by the fiber length. After passing the fiber, the optical signal is converted back into an electrical RF signal. This signal is identical to the input RF signal. We provide any fixed time delay between 0.1 and 300 μsec to our customers. The ODL is operated as a standalone unit with no need for any intervention by the operator. It can also be controlled externally from a PC through various communication interfaces. 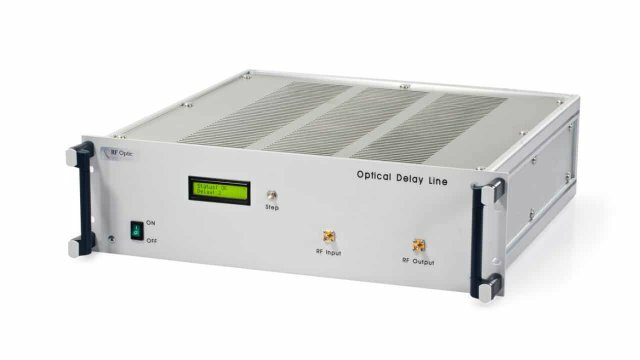 RFOptic’s ODL is a compact solution, which provides superb performance including accurate time delay with ultra low noise. The ODL can be purchased with an integral switch unit supporting up to 8 predefined time delay values in a single ODL unit.